I'v dreamed to see at picture or a photo of bazoomana, since 1990 but impossible to see one . well, thank you yet again for more greatness, stefan! i have always loved his two bärenreiter albums. Which raises a question I hardly dare ask, if you might happen to have the Fanta Sacko album from that same series? That would be absolutely spliffing! Mr Stefan you a great patriot Malien. They are celebrating the 50 years of the independence of Mali. Hello ! 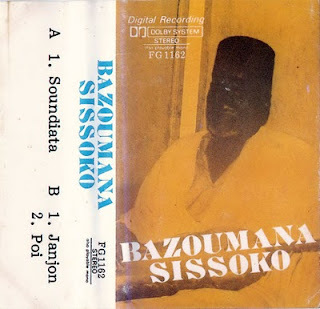 I'm searching the albums "Le Vieux lion I & II" of Bazoumana Sissoko. Do you know where can I download the songs of this great jeli ? Thank you ! @Anonymous: Both albums have been posted on the 'Anthems for the Nation of Luobaniya' blog, and I gladly and without hesitation refer you to that blog. I am an ethnology student writting a term paper about blind musicians in Africa. I was wondering who has written this biographie. I'd like to use some quotes.